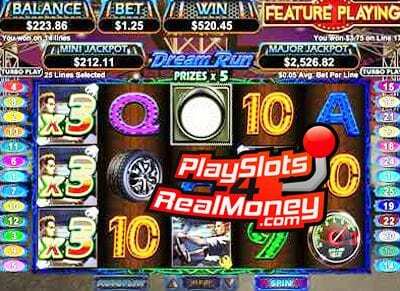 Dream Run Slots is a five reel, twenty-five pay line online video slot machines that are powered by Real Time Gaming software. RTG released this car racing themed game in 2013 before they started to release 3D games like Football Frenzy and Voodoo Magic. If you like playing video slot games for real money with two progressive jackpots or are just a Fast and Furious or Nascar fan, then this game may be for you! 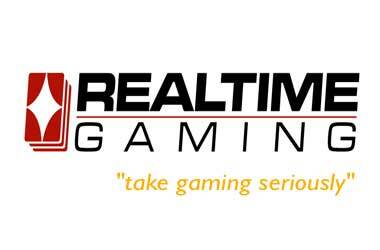 Dream Run was such as hit Real Time Gaming [RTG casinos] released Green Light a few years later. Dream Run has two progressive jackpots at stake and also features free spins, a bonus game, scatter wins, a Dream Run Racing feature, a Nitro Racing feature, a multiplier and a wild substitute symbol. Play this game free, for real money or with Bitcoin at any one of the recommended sites listed on the right-hand side of this review page. Make sure you click through our links and banners. Claim your free spins, and you are USA slots sign up bonuses when you are ready to make a casino deposit. The coin denominations when playing “Dream Run” online slots for real money at one of our recommended casino gambling sites are similar to other RTG slot games. Get anywhere from one penny, $0.02, $0.05, $0.10, $0.25, and $0.50, one dollar and up to five dollars per pay line. The vast betting range makes Dream Run ideal for someone playing online slots for pennies or high rollers spinning the wheels for high stakes. The jackpot does not trigger at random in this game. There is a specific way to win the minor and the major progressive jackpot when playing Dream Run online slot machine for real money. Keep in mind that there is the major progressive jackpot, which increases the chances of winning some extra cash. The symbols that you will see on the reels as you spin the wheels are indicative of the car-racing theme. You will see a Steering Wheel, a gun, a Traffic Light and other car racing symbols. The secret to winning the progressive jackpot is getting to the Nitro Racing Feature. You have to win three races in the Nitro Racing Feature and get up to the fourth race, which is where you will be able to earn some real cash. The blockbuster movie “The Fast And The Furious” with Vin Diesel dazzles Hollywood and folks all over the world. Dream Run slots are loosely based on this epic movie that discusses nitrous oxide booster buttons. In Dream Run, the slots developer brings nitrous oxide booster buttons along with other things from The Fast And The Furious to life in their slot machine. Moreover, they make a nitrous symbol along with icons like futuristic looking racing wheels, speedometers, and chrome types. Of course, there has to be a gun as a symbol, right? What happens if you are racing for pink slips and someone tries to get away? Don’t you need a gun? It appears that RTG gives this title some extra entertainment value of adrenaline and danger.